This is my assignment for colored pencil class. 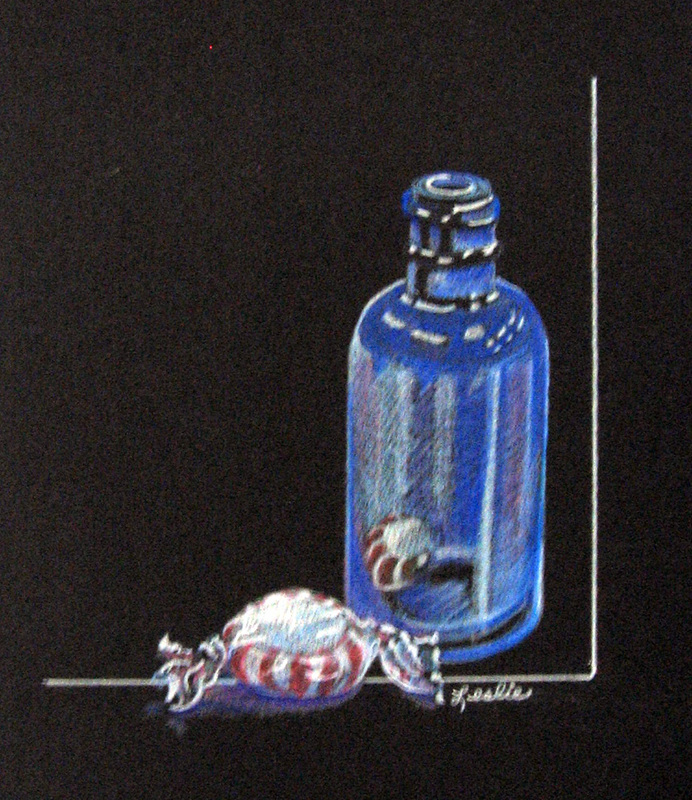 We were to render a glass object on black paper. This is for all of you who are enduring record temperature highs around the globe! I painted outdoors last Friday evening for the first time this season. It felt great. My subject was my friend’s pond. I learned something new. As it became dusk, redwing blackbirds began to descend and cling to the cat tails around the edges of the pond. 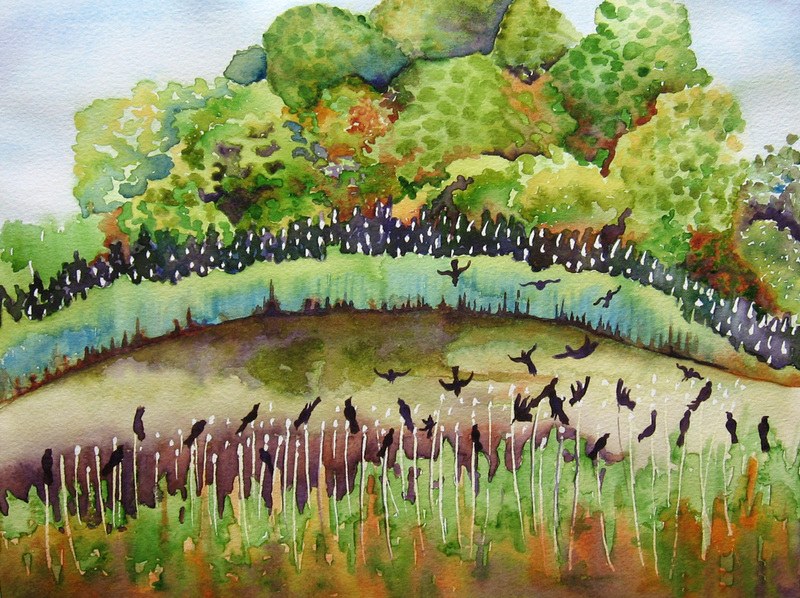 The darker it became, the more birds nested until there were hundreds of them chattering away. It was quite a sight! Yousei has posted a haiku of a blackbird soaring against blue sky here. 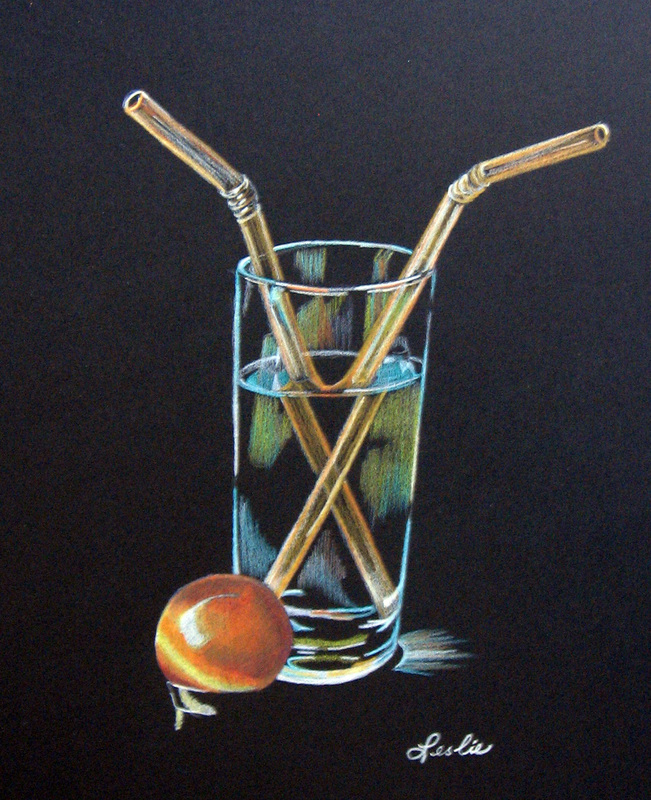 This week in colored pencil we worked on still life glass objects on black paper. The paper is Strathmore Artagain black. I liked this surface. We were to pay attention to the darkest darks and allow those shapes to be the black of the paper. 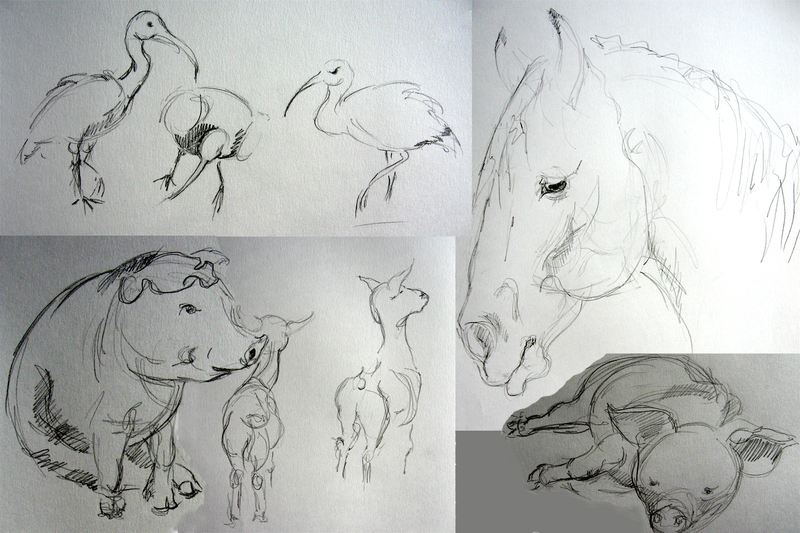 Today, Jay and I attempted to draw at the zoo. Holiday! Crowded! We need to go on a slow weekday. However, the children’s zoo farm animals were great and so were the Scarlet Ibis. I collaged the few drawings I did. More of the zoo later! 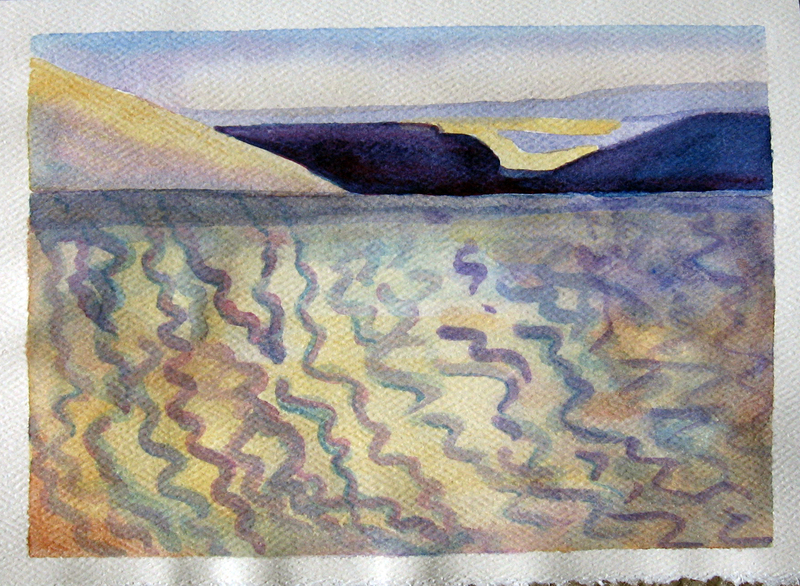 Last night was the last night of watercolor class. 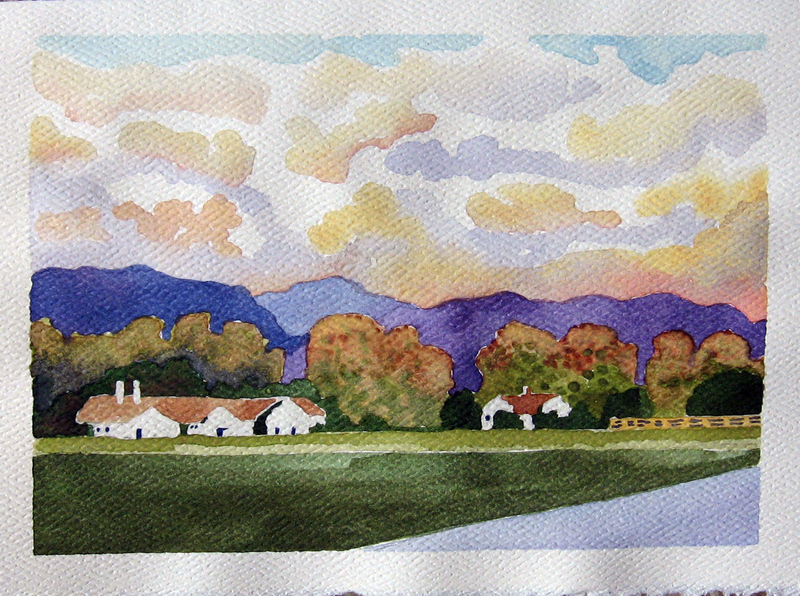 We painted mini landscapes on Strathmore Ivory with Deckle notecards. It was a great exercise in getting used to a new surface and to use our no. 2, 4, and 6 round brushes. 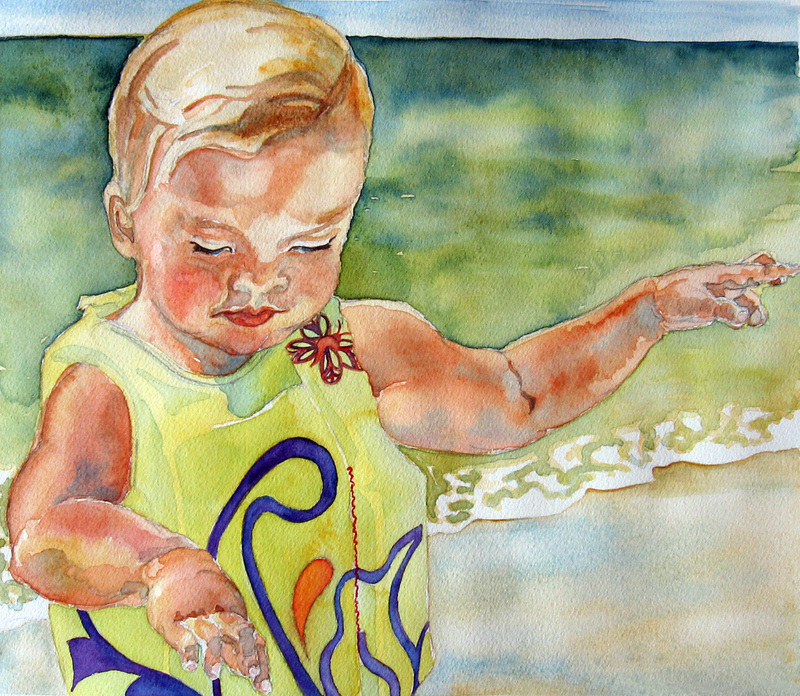 We found that you could sponge on this paper and use frisket or masking fluid. It was better to mix our colors on the palette because they didn’t run together readily on the paper. It would accept glazing. Salt did nothing to very little. Once the pigment was applied, it was there. There were no lifting properties. I guess that is a good thing since these would be sent through the mail and you wouldn’t want them to arrive at the end of the journey destroyed because they got caught in the rain in some mailman’s bag. 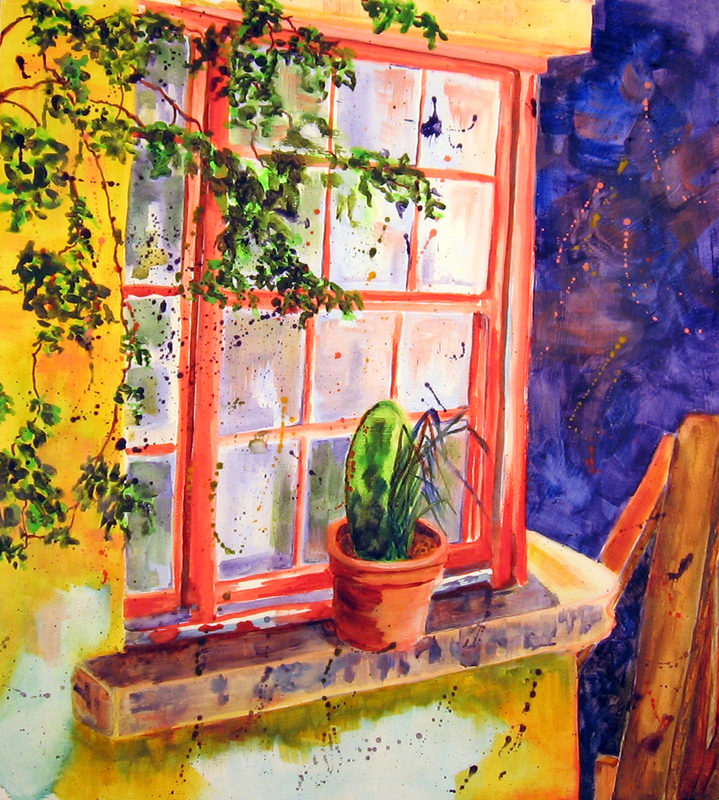 Artist, Beth Parker, has painted a series of windows on her blog. Here is one and two and three. This week in colored pencil class we worked from groupings of plastic flowers. 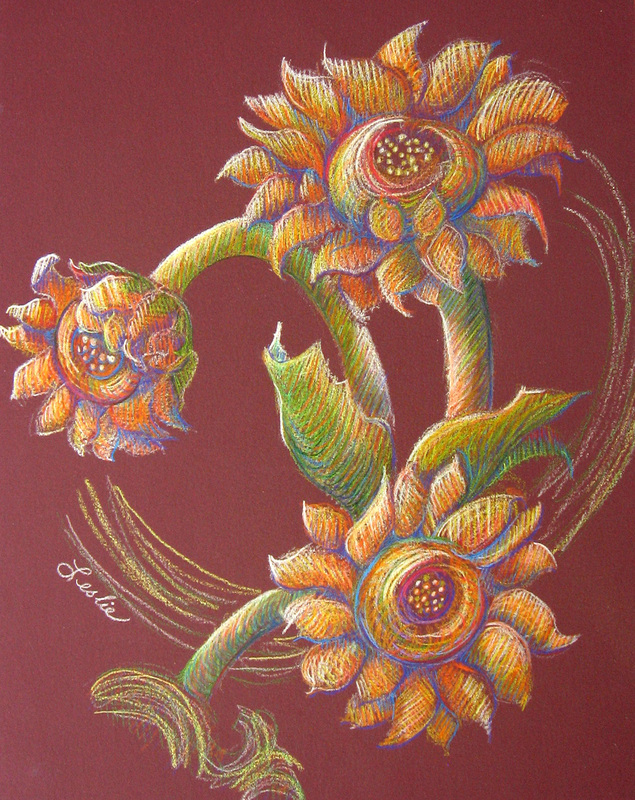 I drew my sunflowers on sanded pastel paper with a colored background. 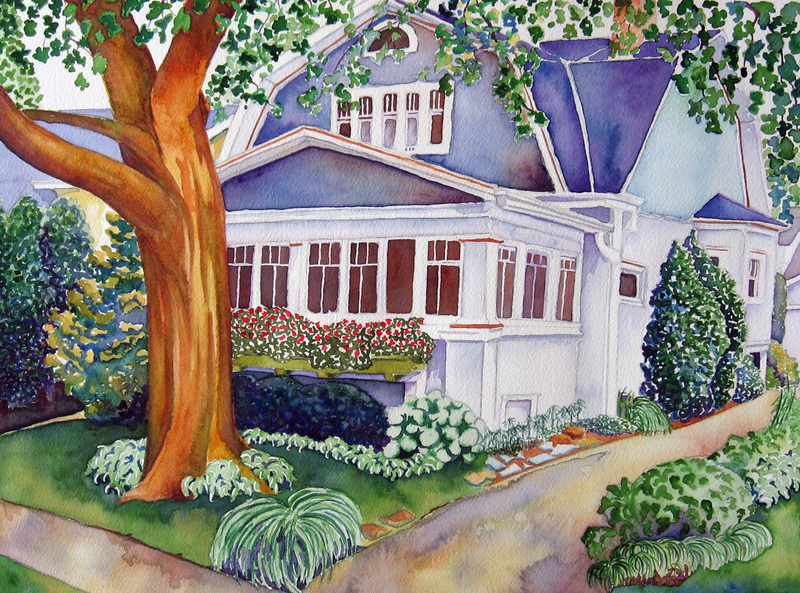 As soon as I learned that I had to choose very light or very vibrant colors, it was fun. 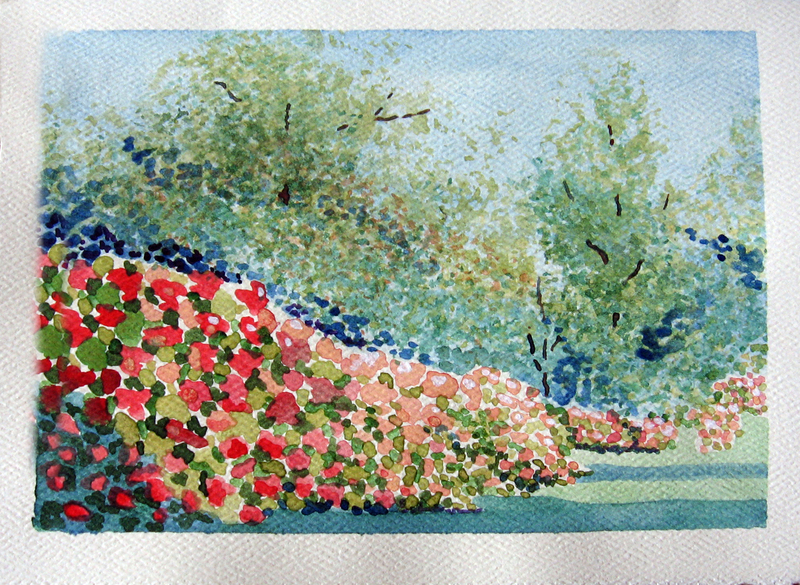 Due to the fact that I could not trudge home with the flowers, I improvised to finish this piece. The paper eats up the pencils faster than regular paper, but I liked the effect enough that I’ll use it again. 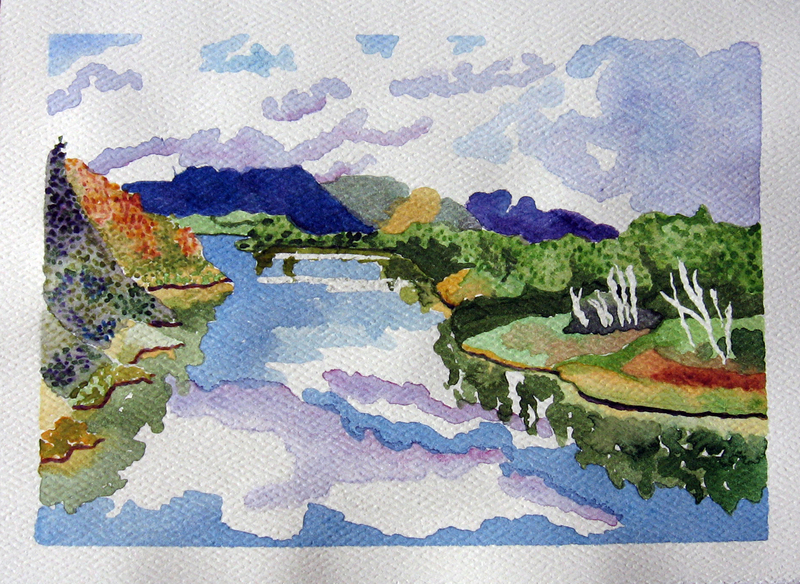 This week in watercolor class, we are working on man-made objects in a landscape. We talked about looking for specific shapes. We discussed paying attention to the angles of the edges of the object and or street. We discussed looking for shadows caste by edges of the object on itself as well as the terrain around it. I pointed out that the size of a window pane changes depending on where it is located and to look for overlapping shapes. 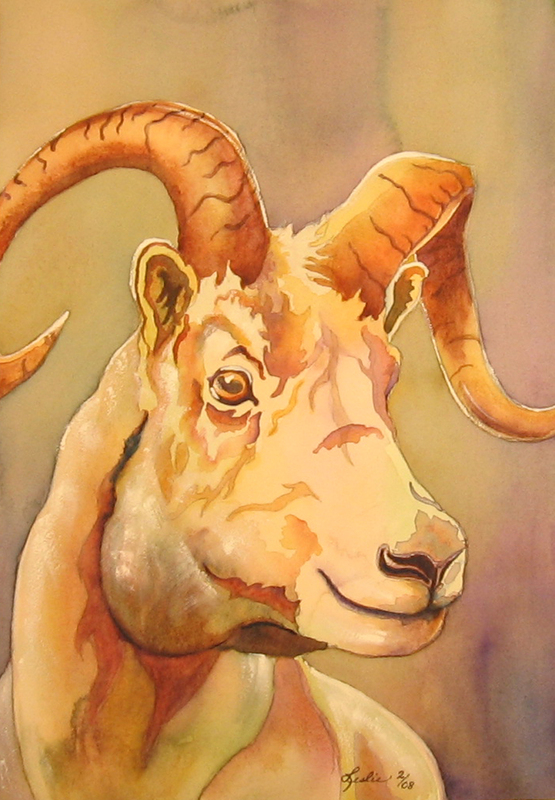 I painted this demo to show my students that you can use color and still end up with a subject that reads as white.